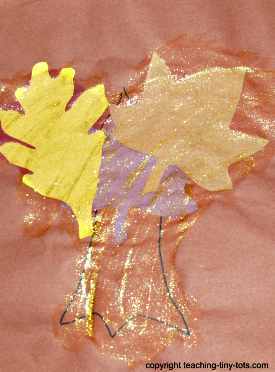 Toddler Activities using creating pictures with cut outs from construction paper and sheer glitter paint. Great for working on fine motor skills and learning about Fall. 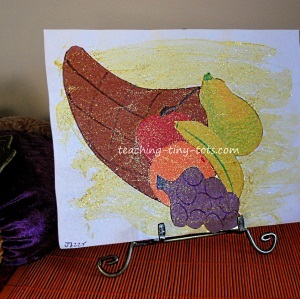 Great beginning paint and collage style activity for toddlers as early as two years of age. Select colors to be used and cut out shapes of fruit. Have the real fruit handy if possible to talk about it as you make shapes for your child. Have your child use glue stick to glue on the cornucopia first and then the cut out fruits. If you prefer a pattern instead of cutting it freehand, type "free printable cornucopia or fruit" in google and you can find a number of pictures you can use as patterns. Cut out leaf shapes and draw a simple trunk on the paper. Have your child glue on the leaves. Using the sheer glitter paint tpadd some sparkle to the picture. Painting and gluing is a great way to help develop fine motor skills as well as a great visual way to reinforce color recognition.